I received mine yesterday and have been having a blast since. I ran it at one of our local scale spots. I ran it fully submerged for quite awhile. After about a half hour of running constantly in water the motor let go on me. Most likely this was due to the dirty dirty water we were running in. Last edited by Harley; 04-11-2012 at 12:41 PM. Stage 3 1-piece locker - No longer available. Team 3six seats and scale acc. Last edited by Harley; 04-30-2012 at 11:46 AM. Last edited by Harley; 04-30-2012 at 11:17 AM. 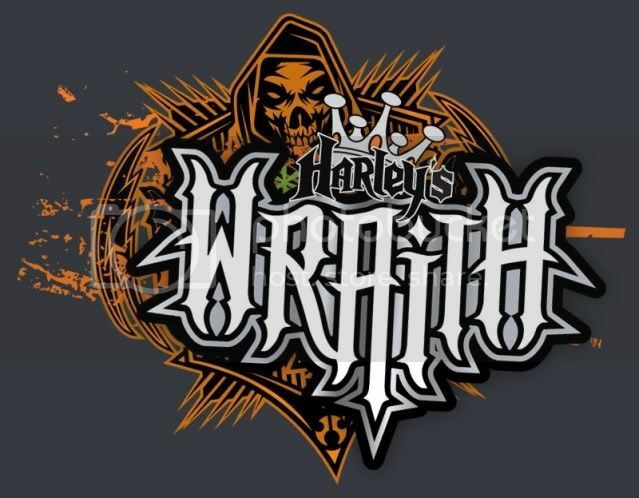 sounds good harley is that bone stock? You got yours straight from axial right? Well since the 20t croaked now you have a good excuse for a brushless system! I like your Wraith better than Jason's. I'm not used to a Harley thread with a pic on the first post. Maybe the world really is coming to an end. So it has been a busy couple of days since I got the truck. I will give my first thoughts on the truck so far. Chassis: The chassis is very rigid but forgiving to extreme hits. The skid plate is very large but does a nice job of packaging everything. The upper and lower link mounts being attached to the skid make this a very easy truck to work on (I'll get to that later). Suspension: The shocks that come on the truck will be familiar to many people already. Mine came out of the box leak free and after a bunch of hard bashing they stayed that way. However, the links will be familiar to many people as well. This is one area I see much room for improvement. They bend easily which greatly helps reduce breakage, this is not the problem though. The problem is the fact that they lose their shape quickly. Electronics: The stock electronics exceeded my expectations for a RTR truck. 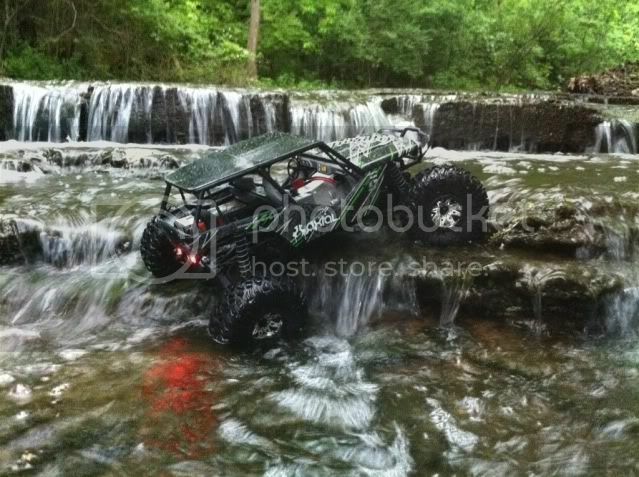 I have owned MANY Axial RTR's but this is the first one I have had that uses the new AE2 ESC and 2.4 radio system. The radio feels much more solid than most cheaper radios. Comparing it side by side to an RC4WD radio it simply blows it away as far as the feel of quality. The ESC also surprised me. It handled being completely submerged for extended periods of time and never gave me as much as a flinch. If you plan on running 3s lipo however, an external BEC is a must. 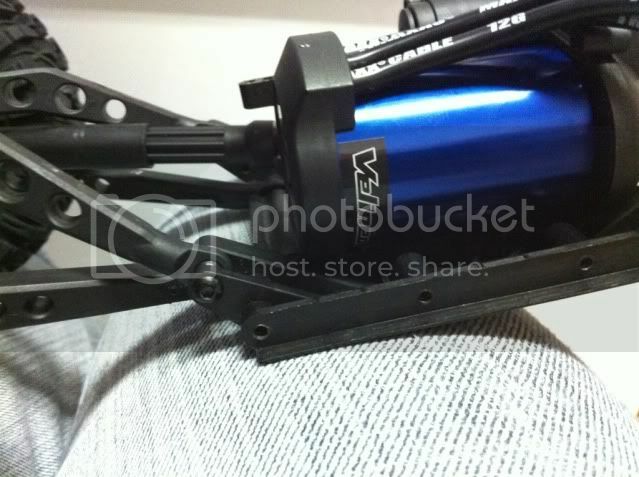 Drivetrain: I'm in love with these axles. The style is perfect for us. Scale style, great width, proven AX10 series gears and the new XR10 style knuckles. The new CVD style driveshafts held up well to the stock power. 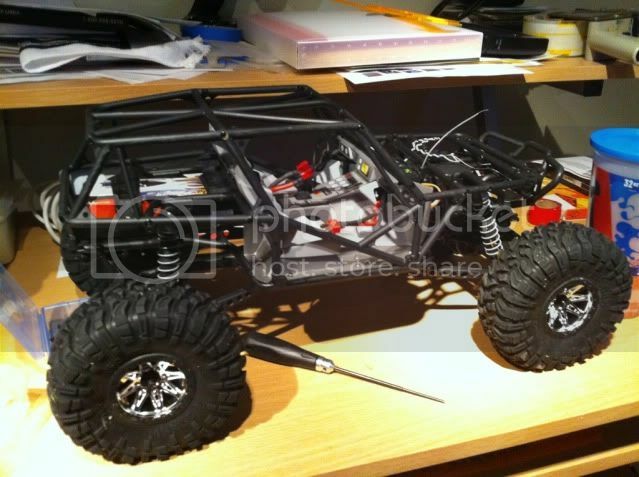 The transmission will be familiar to pretty much anyone in the RC crawling scene with a slight twist. Lots of upgrades out there for us already. Wheels and tires: The stock setup looks and works good. I love the tires, they really do well in the wet and mud. The sticker R35 compound will be a good upgrade for the rocks though. The wheels are non beadlock but do a good job of fitting the style of the rig. It's because I beat him to posting it by 2 minutes! Yeah yeah, Keatwo already covered this. Lets see it on some some jumps! We shot a bunch of video last night at the Falls. I'm going to try and edit it together quick. Im assuming you waterproofed the axial esc but left the radio alone in the stock "water resistant" box? No, I didn't do anything. The ESC runs just fine completely underwater. So after frying the motor last night I headed over to Freq E Designz to start doing some work on making this truck look different than the rest. We didn't get my skinz finished up but we did get the templates created. Really just need to come up with what theme I am going to go with on this truck. How about a collage of self portraits?